I found about twenty small (~ 1cm) pieces of seaglass in two visits to this beach. Most of the pieces I found were flat and triangular. 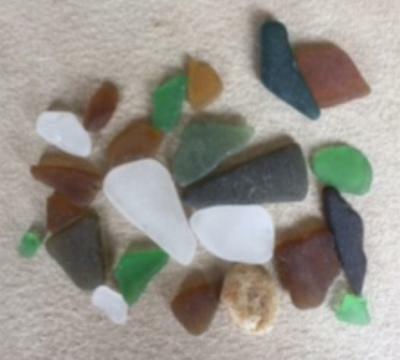 Not much seaglass to find, no unusual colors, and the pieces are fairly small, but all pieces were nicely smoothed with a few irregular, interesting shapes. Although this is a public beach, access is private in places (via the campground). There are public access points along the landbridge. The first two times I went to this beach I was disappointed that there wasn’t any seaglass, but the third time I found that there actually is seaglass: you have to really look for it. I wouldn’t go out of my way to visit this beach just for the seaglass.